Meowth: You don't stand a chance against us. This time we're going to steal your Pikachu. Jessie: Yes, oh yes we will! And then we'll gouge out your eyes, carve out your insides, slit your throat, and tie a ribbon made out of your guts around your mutilated carcass MuahahahahahahahahohohohohohohoOHOHOHOHOHOHOHOHOHOHOHOHOHOHOHOHOHOHOHOHOHOHOHOHOHOHO!!!!! *Jessie's pupils start drifting apart* by E.K.A.N.S. Jessie (in a gossipy fashion-freak voice): Oh my Arceus! Is Meowth wearing the brand-new stylish 100% pure silk limited-time buttwarmers with gold embroidery??!! Oh my gaw, dat is SO stylish!!!! by E.K.A.N.S. Scroll down the list of all completed captions. Find a caption titled "Brock prepares to rip his shirt off". Read the #1 caption. This is that next time. by E.K.A.N.S. Meowth: We'll let her go if you accept that we're not letting her go. by E.K.A.N.S. SIM SALA BIM by E.K.A.N.S. Jessie: BarrionKA ArabitSU!!! by E.K.A.N.S. Jessie (in a gossipy fashion-freak voice): Oh my gawsh! Is Meowth wearing the brand-new stylish 100% pure silk limited-time buttwarmers with gold embroidery??!! Oh my gaw, dat is SO stylish!!!! by E.K.A.N.S. Brock prepares to rip his pants off. by E.K.A.N.S. Meowth farted in Jessie's face and he's proud of it. by E.K.A.N.S. 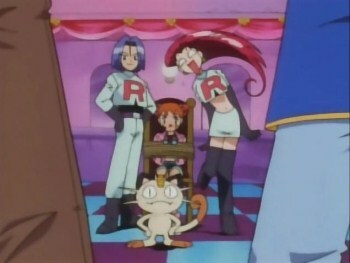 Meowth: If you tell us who farted, we'll let her go. by E.K.A.N.S. Jessie: The fart in this room can't be that bad, can i- WHOA, SWEET BABY JESUS! by E.K.A.N.S. Meowth: This reminds me of when I was 5 years old, living on the cold, lonely streets of Vegas, feeding on scraps and eating the dirt, living the hard life, nowhere to go... 3 years later No one to love, no one to be... nowhere to go... I was living off a few pennies a day... I thought it would never end... I was living on scraps and dirt... and I had no one to love... and no hope... and I was living on scraps and dirt... Those were the days. I had nowhere to go... I was living on scraps and dirt... no one to feed and take care of me and love me... and nowhere to go... by E.K.A.N.S. Meowth: Hey, what do you call an Exeggutor that runs a business? An Exec-utor! Jessie: I WILL obliterate you. by E.K.A.N.S. Ash & Brock: Give Misty back, or we'll kick you in the balls. Meowth: I don't have any. =P by E.K.A.N.S. Meowth: Hey, what do you call a backwards Ekans? A snake! Jessie: You stole that joke! by E.K.A.N.S. Meowth: Okay! We'll let her go. But on *one* condition: that we don't have to let her go. by E.K.A.N.S.